Hi!!! I hope everyone had a fun- filled 4th of July (feel free to send over some celebration pics). Unfortunately, here in Shanghai, fireworks are banned in city limits and apartments aren’t grill friendly 😦 However, just because we couldn’t bust out our red white and blue pride doesn’t mean we didn’t have plenty to celebrate. More importantly, AP scores came out and……. I got all 5s! Sure, these “achievements” aren’t much, but any excuse to celebrate (read: eat) is good enough, right? Luckily, my parents agreed, so let’s eat! 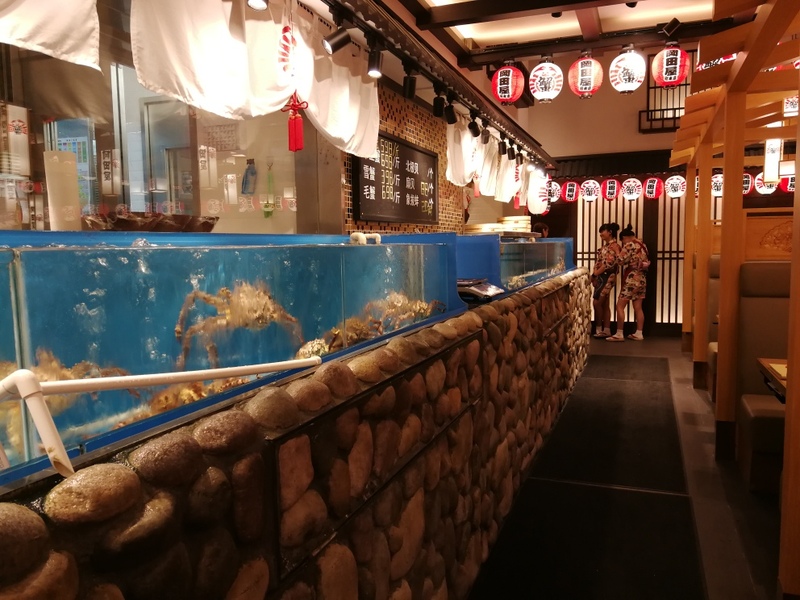 Well, if the giant plastic crab at the entrance didn’t give it away, 蟹的岡田屋 (translation: Crab harbor house) is all about the crab, Hokkaido crab to be exact. 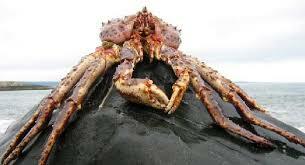 King crab, Snow crab and Hairy Crab (obviously not Chinese Hairy Crab). 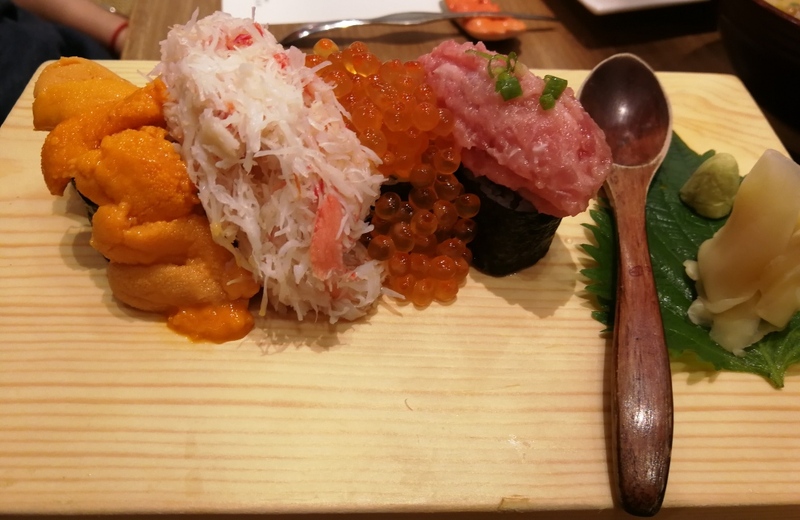 In addition to crab, they also offer the usual Japanese classics. There are 13 locations in Shanghai, and the one at the Century Avenue Subway station is literally a mile from my house. So, let’s eat! Okay, this was a crab feast, but I couldn’t resist some of the classics. Here’s what we got! Waterfall Sushi- This plate may look like the work of a messy chef, but make no mistake, there’s a reason it’s called waterfall sushi. In fact, “waterfall” style= more toppings for us! Speaking of the toppings, the fish could not have been more fresh. 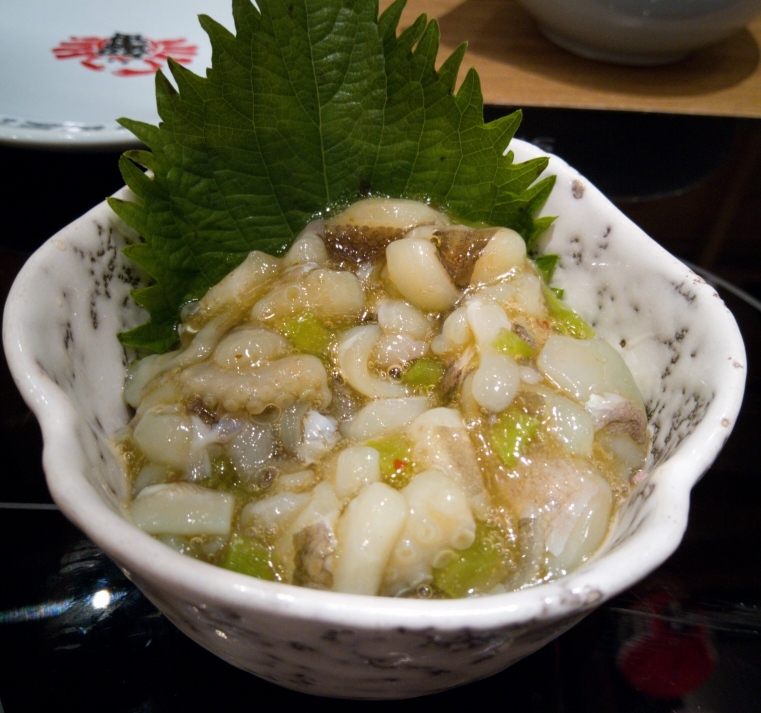 My only problem was that the brine of the salmon roe had a strange sweet pickle taste. The rice was also phenomenal, but who cares, it’s about the fish right? 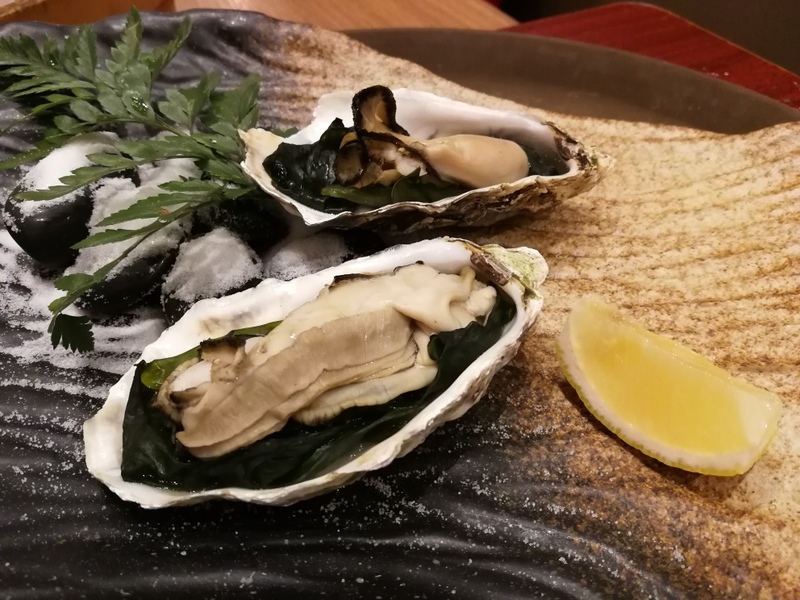 Grilled Oysters- Ever since having those giant, fresh grilled oysters in Hiroshima, I’ve been on a search for… oysters. Lucky for me, these were on the menu. 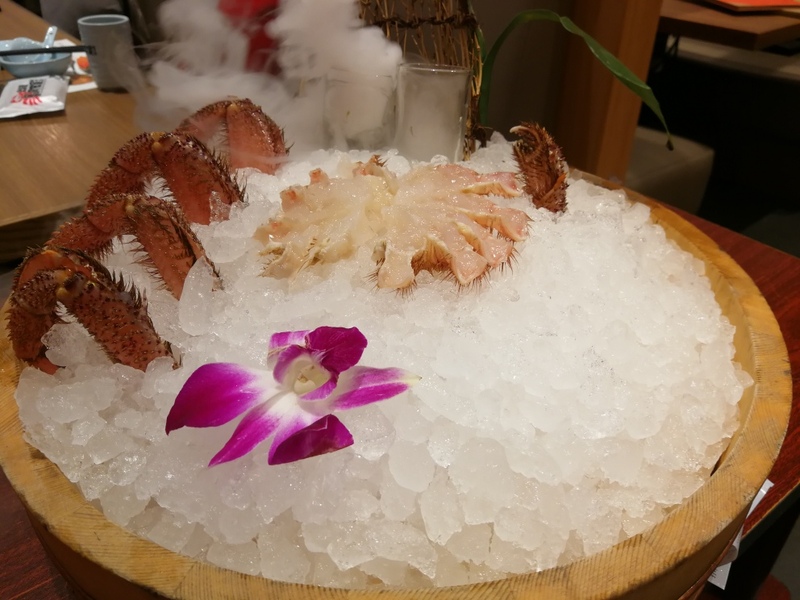 I was pretty skeptical at first, but then I realized that those big rock- like things sitting at the bottom of the crab tanks were actually oysters. 20 minutes later, our oysters were served sitting on rocks and sprinkled with salt. While I can’t say they were as good as the ones in Hiroshima, they were by far the best oysters I’ve had since then. ORDER THEM!! 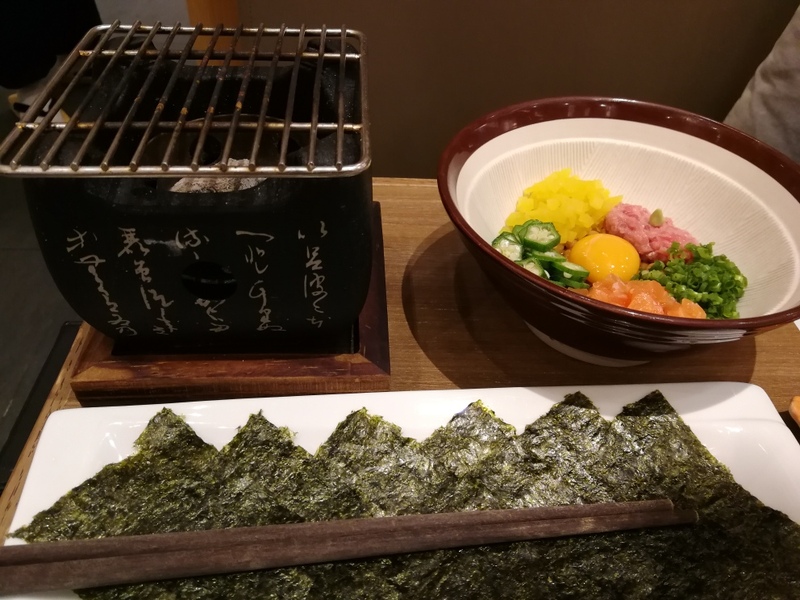 !… then go to Hiroshima. 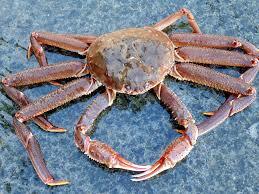 ….. enough of the boring stuff….. Crab time! 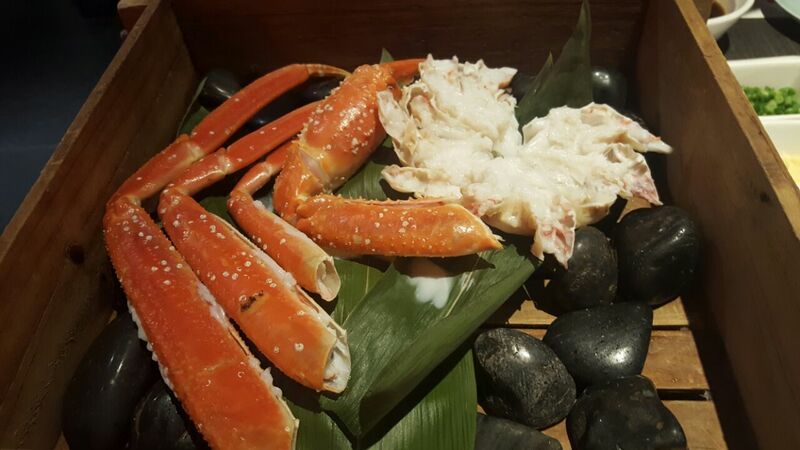 蟹的岡田屋 offers fresh and frozen varieties of all three variety of Hokkaido crabs. 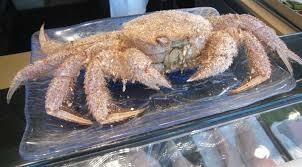 Only Hairy crab is “in season”. Guess what we got? This beauty weighed in at almost 650g. How did it taste? Well, let’s just say we got our money’s worth. 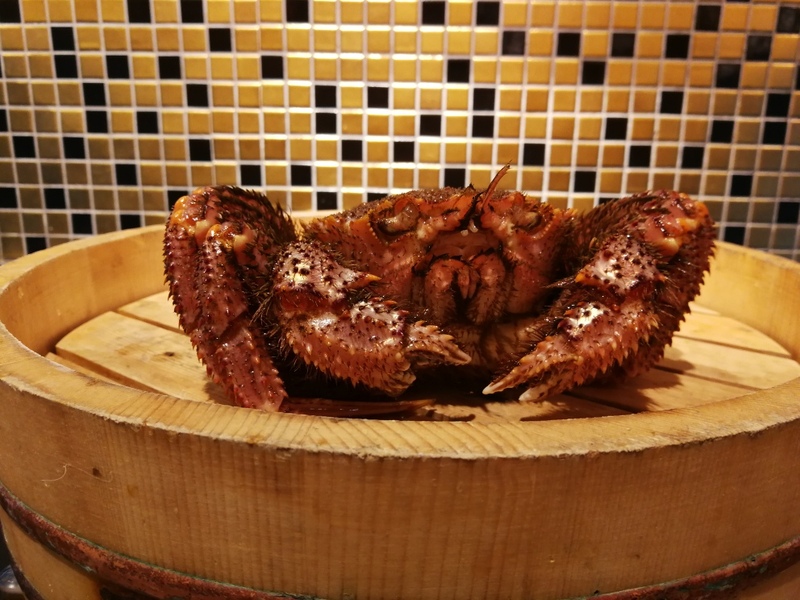 The crab sure cost a pretty penny (nearly 100USD/500g), but a single bite of the sweet, succulent meat proved that sometimes, good eats are truly not about the money. 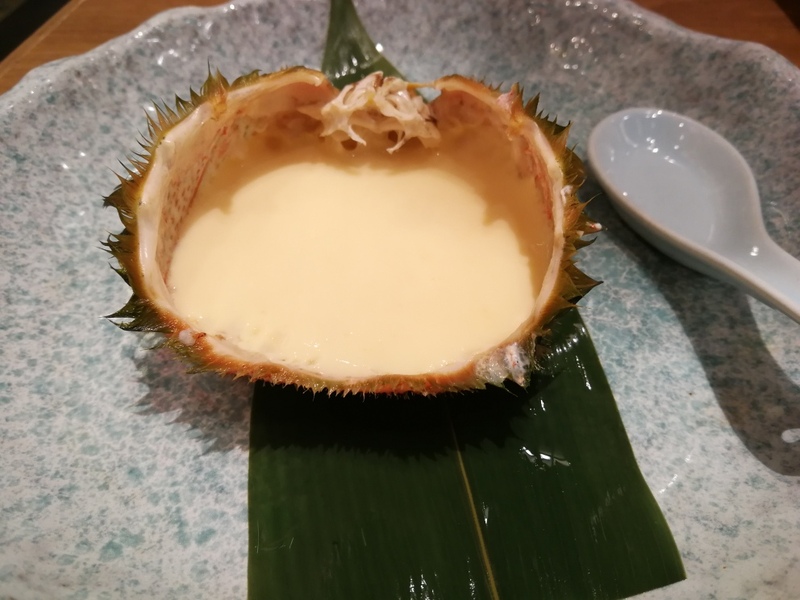 crabshell steamed egg. Again, nothing less than smooth, umami perfection. 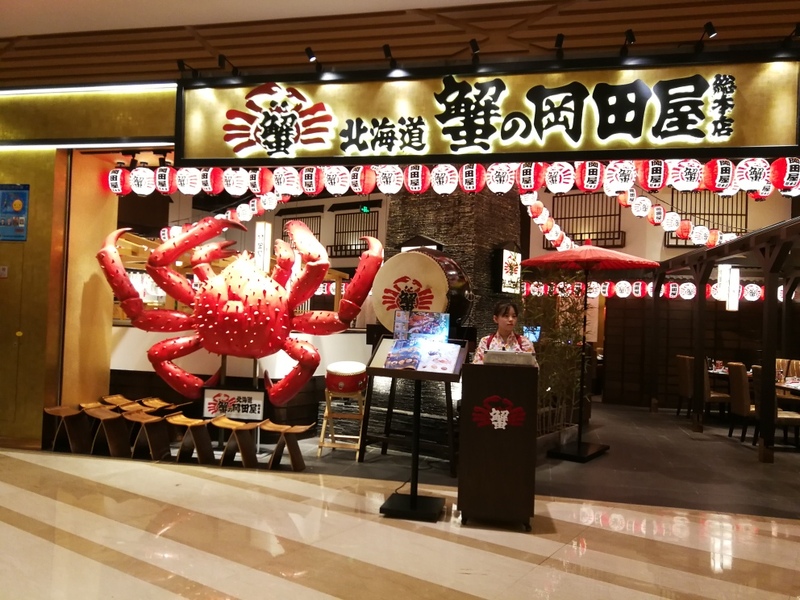 If all that crab wasn’t enough, they also offer free hotpot rice (basically rice cooked in the remaining hot pot broth). 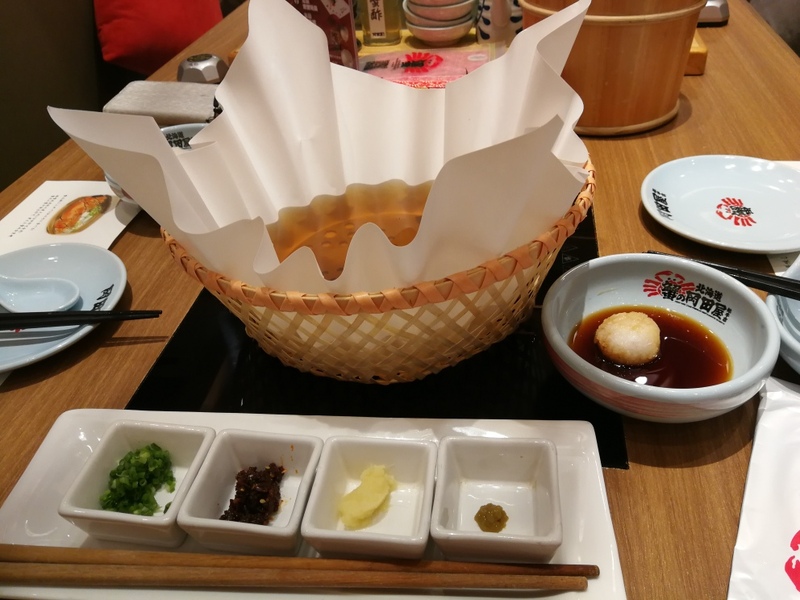 We were stuffed, so no rice, but we literally drank every drop of the incredible kombu broth. The service and atmosphere were top notch, but a step below the food. 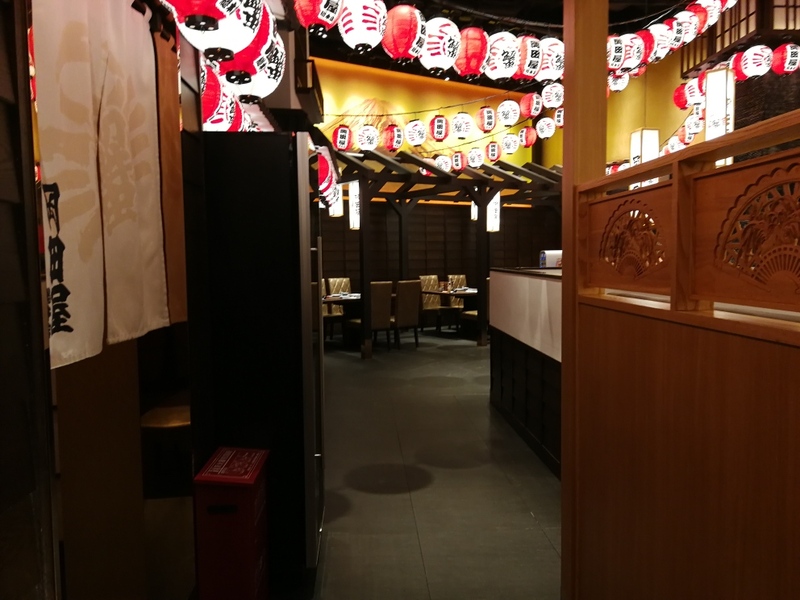 I loved the traditional Japanese style decor. It didn’t feel at all like we were in a shopping center. However, since the restaurant is in a shopping plaza attached to a subway stop, we could hear (and feel) the trains go by beside and under us. The staff were also a bit too enthusiastic in greeting and bidding farewell to guests, and it got a bit annoying. With that said, the staff were extremely helpful and courteous. One even gave us a complimentary plate of nori. The food also came out quickly and we were never waiting for food. Overall, this place may be pricey, but it was worth every penny. I’ll definitely find every excuse to come back. I look forward to trying some of the other locations to see how they compare.